No, this is not a cheery book that you could drop into someone’s Christmas stocking. It is harrowing reading which will leave you drained by the experience. But it’s an important book, and superbly well-written. 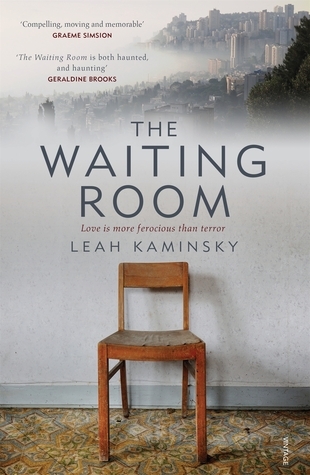 In The Waiting Room, debut novelist Leah Kaminsky has captured fear, guilt and unresolved anguish in a novel that will wring your heart. Almost all of the story takes place in a single day. The novel opens in Haifa, in 2001, in the aftermath of a suicide bomb. Dina is a doctor who is picking her way through the bodies and the rubble, and trying to process what has happened. Little details distract her, as does the kicking of her unborn child. At this point in the novel the reader does not know how or when she arrived on the scene, or anything about the bodies strewn about. The scene is abstract, impersonal, with emergency services efficient amongst the chaos – as in the safety of our homes we often observe these scenes to be in the aftermath of atrocity. The focus then shifts to earlier in the day, and the events that have led up to the bombing. Sadly, we have become used to reports of carnage in the Middle East. (There was another atrocity on last night’s news, and one of the victims was a peace activist). The Waiting Room reveals how people living in these places have to – for their own sanity – become inured to the fear that penetrates everyday life, despite the ever-present security systems. Bars on the windows in primary schools and daily evacuation drills send a chill down my spine but that is how it is in Israel – and Dina’s husband Eitan who grew up on a kibbutz thinks nothing of it. But Dina, who grew up in suburban Melbourne, isn’t used to it, not even after years of living in Israel, and she yearns for the quiet safety of Caulfield. She has idealised Australia as if it is a Promised Land, forgetting that as an adolescent she couldn’t wait to escape it. But leaving Israel would also mean leaving Eitan, and Dina is not ready to face up to the fact that her marriage is fragile, ruptured by her husband’s scorn for her fear and his fierce pride in Israel. What makes Dina’s state of mind more fractured is the interminable presence of her mother, who survived the Holocaust but passed its sombre inheritance to Dina, telling her its dreadful stories throughout her childhood till, horrifically, she wished her mother dead that she might be relieved of the burden. But when her damaged mother finally takes her own life, the horror intensifies because her ghost is ever-present in Dina’s mind. This mother is like a living, breathing character, who intrudes into every situation. There are light-hearted moments when she dispenses advice, cajoles, and nags like every stereotypical Jewish mama you’ve seen caricatured – but too often for Dina’s fragile state of mind, this mother is telling Bergen-Belsen stories, mulling over the jealousy she felt for her husband’s first wife and child who were lost in the Holocaust, resenting that she and Dina are ‘replacements’ for what was lost. In the beginning of the book this mother is conjured up only when Dina is alone, but as the day moves on, she distracts Dina’s attention from her patients at the clinic, and eerily, is almost present to the old shoe-mender at the market. Rarely does a book capture a sense of place in such penetrating detail. I have never been to Israel, but I can vouch for the authenticity of the scenes in Caulfield because I grew up there and walked its streets with my dear old dachshund Gretel. Kaminsky brings the sights, sounds and smells of Haifa to life, recreates the details of home life with a small child, depicts the competing demands of a busy medical clinic and shows us the world of little Shlomi’s school with great veracity. The only world we do not see is Eitan’s. This husband is peripheral even though he looms large in Dina’s dilemma about where to live. Today, something about Tahirih’s face makes Dina think about an old wooden ventriloquist’s doll she used to have as a child. Or maybe she reminds Dina of her own mother; both women were so traumatised by their experiences. The difference, though, is that while Tahirih found God in the midst of hell, Dina’s mother lost her faith forever. (p. 107). The tension mounts as the day progresses because the reader does not know where the bombing takes place. There are cues placed throughout the text but these don’t register until the end of the book. In this way the reader vicariously replicates Dina’s high level of anxiety: will it happen at her home, at her son’s school, at the market or the clinic, or any of the other places that she goes to in this bustling, chaotic city? 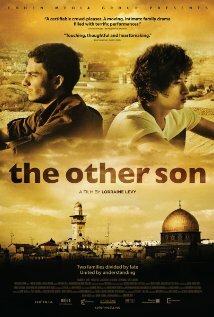 Last week The Spouse and I watched a French film called The Other Son, a translation of the original title Le Fils de l’Autre which fails to capture the ambiguity of a literal translation – The Son of the Other. This film tells the story of an inadvertent swap of newborn babies during a Scud attack on Haifa. One grew up in a Jewish family; the other in Palestine. Le Fils de l’Autre asks the question ‘how do you deal with the sudden discovery that your own flesh and blood has grown up among the feared and distrusted Other, sharing their customs and their values, and not welcome in your own culture’? Like Leah Kaminsky’s novel, it is a reminder that Middle Eastern conflict is a reality lived by real people, much like ourselves, and that the polarities we see on TV obscure a much more nuanced world. Tahirih never thought that she would end up in Haifa. Here people are kind to her. The Arab girl at the kiosk blesses her in Hebrew every day. The tiny Jewish lady next door greets her in Arabic every morning as she beats a rug over the balcony wall. Yes, I read this last week. Stunning novel: evocative, wonderful writing. She really gets inside the head of her character, doesn’t she? I am so impressed! I like your review style, Lisa. Very authentic :). Would love to feature your reviews in our weekly curated email digest that goes out to thousands of people. It’s at the bottom of the RHS menu hiding from spammers in the yada-yada of the copyright notice. I just sent you a msg through your contact page. Let me know! This sounds like a great novel, I will add it to my list. *smile* I love it when people say that!